He may not be as popular at home as he was a week ago, but if you think Lebron James‘ number 23 isn’t worth much anymore, think again. In a sense, it is one of the “hottest” jerseys in the NBA: even an autographed Lebron James Cavaliers jersey found its way to a public burning last week, being set on fire in front of several people. 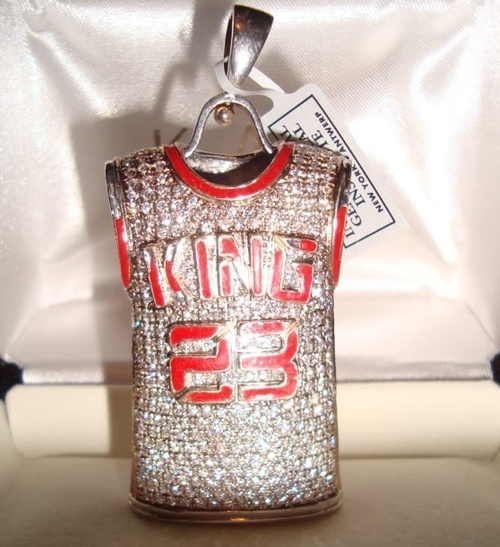 This ugly Lebron James pendant is worth a lot of money. That was four years ago, until recently Vaneisha started wondering if one woman’s trash could be her treasure. “I started really looking at it, and looking at the way it was built, and I’m thinking this could be real”, said Robinson. So Vaneisha took the King pendant to a local jewelry store. They tested the diamonds and told her that they were real. She went a step further, saving up $200 to have it certified by the International Gemological Institute. They estimated Vaneisha’s pendant’s value at almost $10,000. It features 307 diamonds totaling 2.15 carats on a 14-k gold overlay. “I used to go to high school with it around my neck, not know the value of it. I used to just think it was cool ’cause it spins” . An amateur boxer, Vaneisha has put the pendant for sale up on Ebay. She plans to use the money to open her own gym. Despite the backlash caused by James’ decision to leave the Cleveland Cavaliers and play for the Miami Heat, Robinson believes the pendant will sell for top dollar. “LeBron James brand will never die out,” she said. This entry was posted in Custom Jewelry, High Jewelry, jewelry auction, Sports Jewelry and tagged cleveland cavaliers, custom jewelry, ebay, high jewelry, International Gemological Institute, jewelry auction, lebron james, lebron james jewelry, lebron james pendant, miami heat, nba, Red Carpet Jewelry, sports jewelry, vaneisha robinson. Bookmark the permalink.